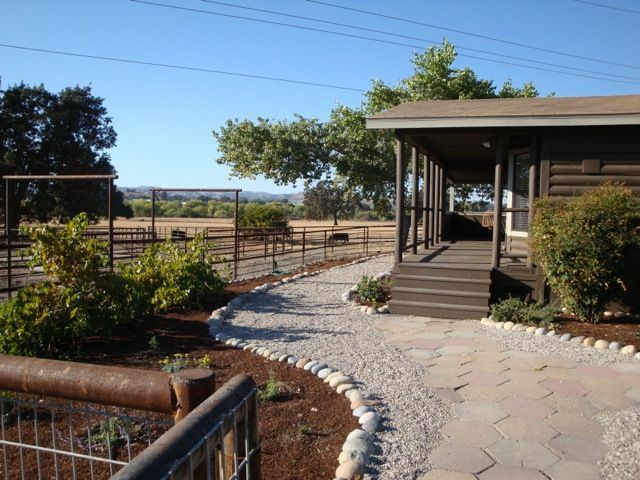 2 bedroom, 2 bathroom cabin on a ranch in the wine country , 4 people maximum. The country setting of this charming 2 bedroom, 2 bath cabin on a hay and cattle ranch is a great place for a peaceful get-away vacation or event-filled trip. It has a fully equipped kitchen with an oven . It has dishes and cooking utensils for enjoying a home-cooked meal away from home. There is a bedroom suite with a king-sized bed, a private bath and walk-in closet. The second bedroom has a queen bed and there is a second full bathroom with a shower/tub combination. Satellite television, a washer and dryer, iron and ironing board are added amenities. I have enjoyed gardening and farming all my life. Looking forward to sharing the country experience with visitors to the Central Coast. It gives a guest the opportunity to experience a pivate ranch setting in a beautiful, pristine area. You will be in the heart of the world-renowned Central Coast wine country with many award-wining wineries to visit. Be sure to travel the short distance to beaches with so few people that you'll feel that you are on a private beach. Also, there are many beautiful lakes that provide a variety of water activties. Hearst Castle, one of the most famous tourist destinations in the world, is just a short, beautiful drive away. Besides restaurants that provide extraordinary culinary delights for any discering palate, the new craft beer breweries, distilleries and cider houses offer a unique tasting experience. Many beautiful and reasonably priced golf courses nearby. The cabin is located just minutes from the historic town of Templeton and other historic sites nearby. Cabin located on a hay and cattle ranch in Templeton, CA, just 25 minutes to the Central Coast beaches in the heart of wine country. The miles to down town Templeton.